Fort Adams guards the harbor entrance to Newport and is the largest coastal fortification in the US. The parade area is 800ft across and covers 6.5 acres. 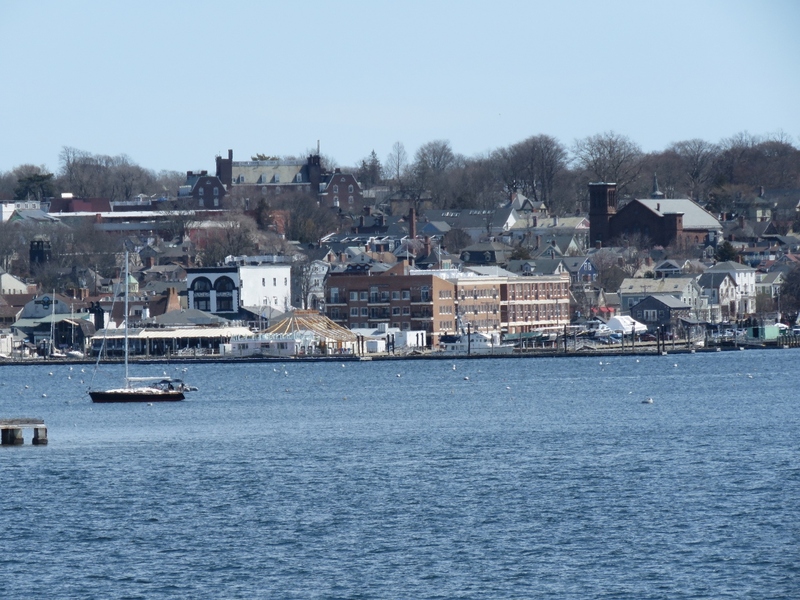 We can see the fort from our berth at Newport Yachting Center and on a warm, sunny day finally got over for a tour. 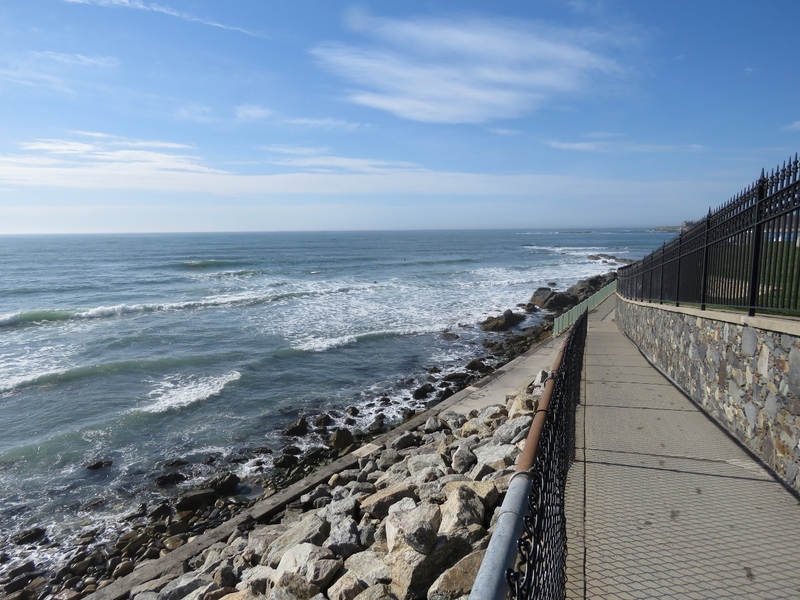 On the way we passed some of Newport’s gilded-age mansions and took in the ocean view along Cliff Walk and Ocean Drive. 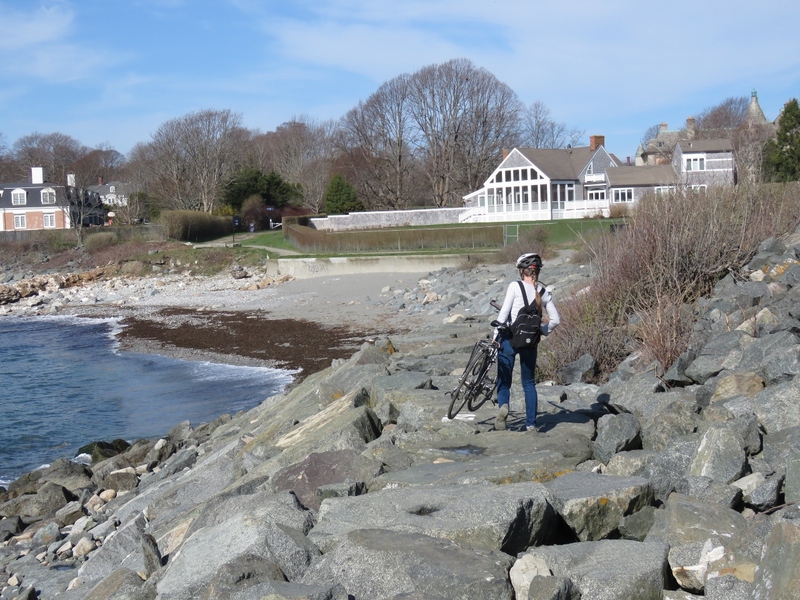 We decided to take advantage of the excellent weather and go out for a bike ride along the seashore via Bellevue Avenue. 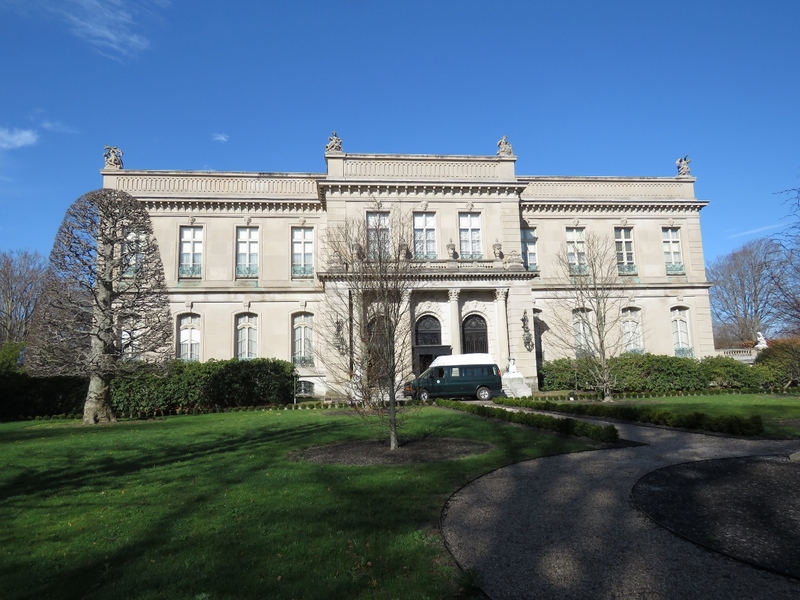 During the Gilded Age around the turn of the 19th century, dozens of opulent stone mansions were built on and near Bellevue Avenue in Newport as “summer cottages” for the America’s richest families. 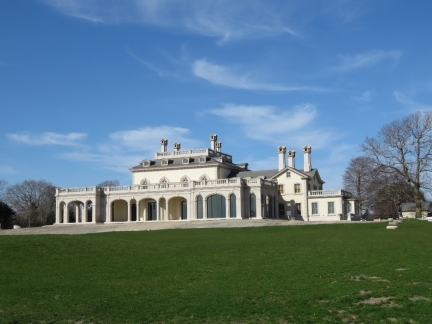 “The Elms” was built for coal baron Edward Julius Berwind of Philadelphia and New York at a cost of approximately $1.5M (approximately $40M in today’s dollars). Elaborate gate at the entrance to Vernon Court. 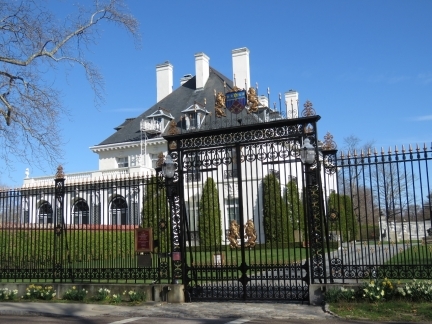 The mansion was built in 1898 for Mrs. Richard van Nest Gambrill of Peapack, New Jersey and heralded as one of the ten great mansions in America. The architects were John Merven Carrere and Thomas Hastings of Carrere & Hastings whose also designed the New York Public Library and the US Senate and House Office Buildings in Washington, DC. The mansion now houses the National Museum of American Illustration. 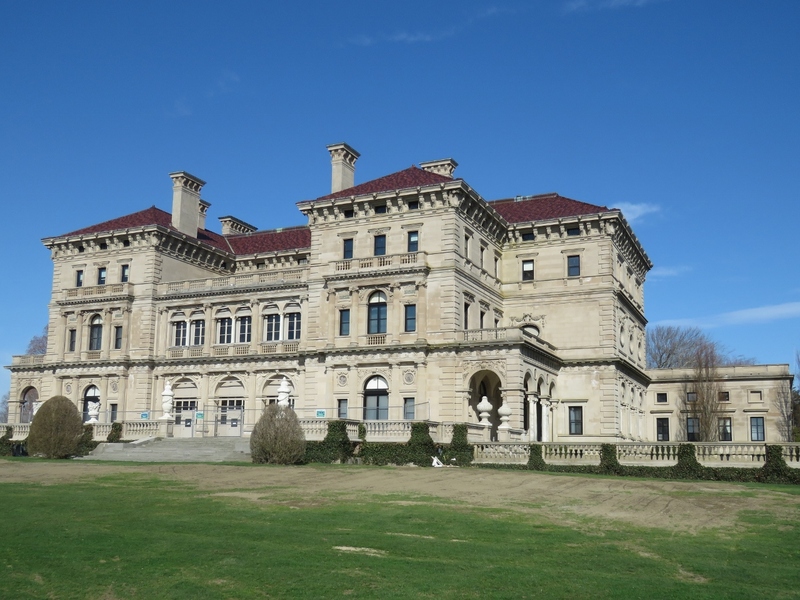 The Breakers is perhaps the most famous of Newport’s “summer cottages” and among the most visited homes in America with nearly a half-million visitors in 2016. 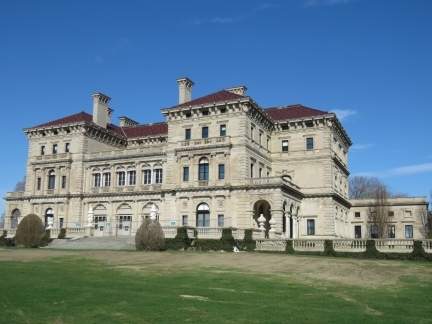 The 70-room mansion was constructed between 1893 and 1895 for Cornelius Vanderbilt II, a member of the wealthy United States Vanderbilt family. 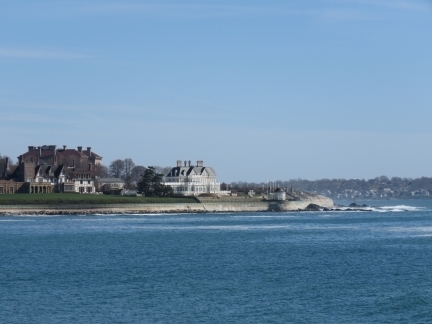 When completed, it was the largest and most opulent mansion in Newport. Cliff Walk runs 3.5 miles along the seashore between the sea and many of Newport’s mansions. 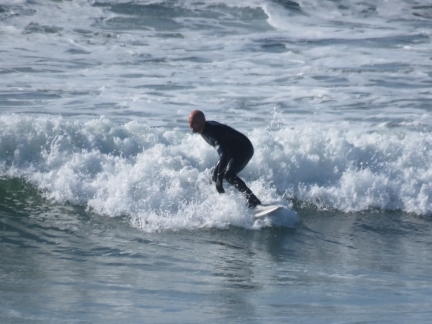 Several surfers were riding the waves that gave The Breakers mansion its name. Carrying the bikes across a rocky section of the Cliff Walk. We knew beforehand that the Cliff Walk had several rocky sections and stairs, but the lightweight aluminum frames of our Giant FCR 2 bikes make them easy to carry. One of the largest collections of cairns we’ve seen. 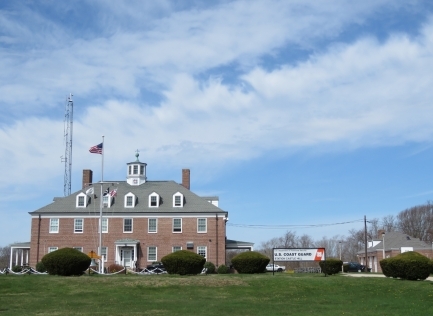 Beechwood was built in 1851 for New York merchant Daniel Parrish. 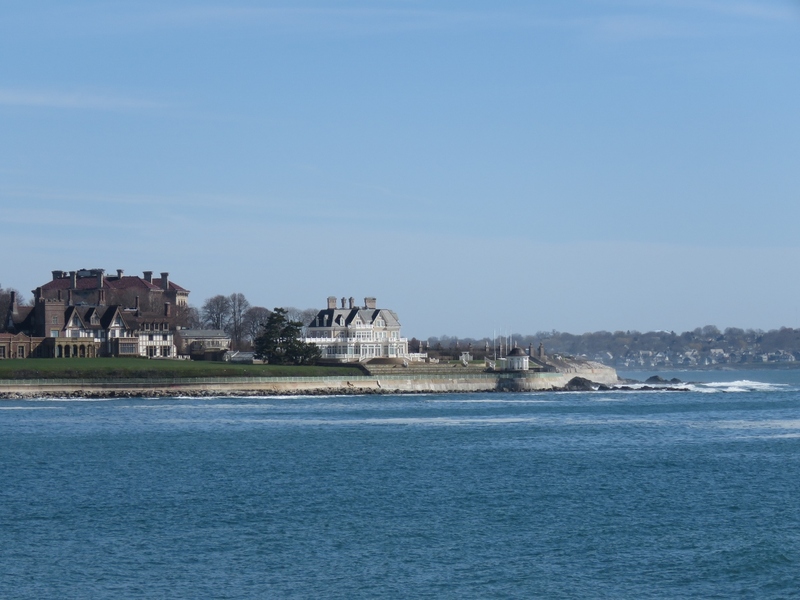 In 1881 the property was purchased by William Backhouse Astor Jr. who was the grandson of John Jacob Astor, one of the richest people in history and America’s first multi-millionaire with an estimated fortune of $20M in 1848 (about $600M in today’s dollars). 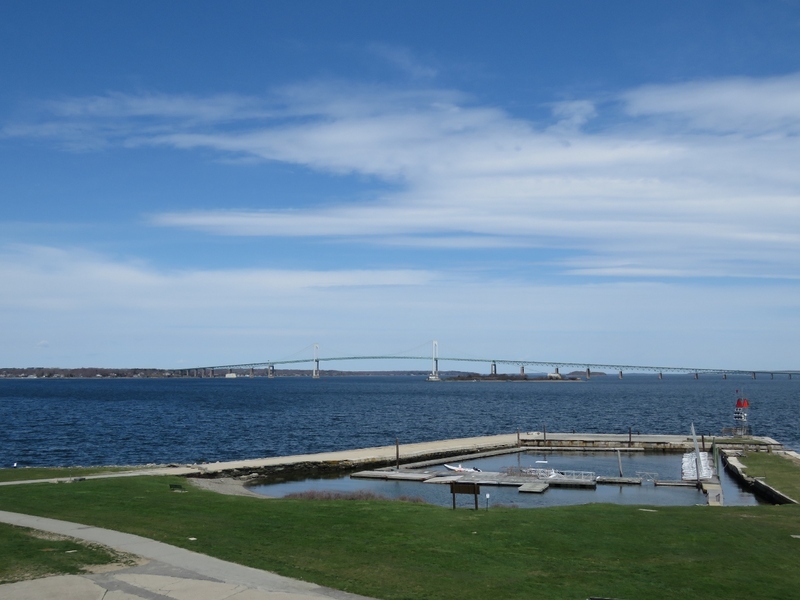 In 2010, Oracle founder Larry Ellison purchased the property for $10.5M, giving many residents hope that America’s Cup racing might return to Newport where it was held from 1930 to 1983. 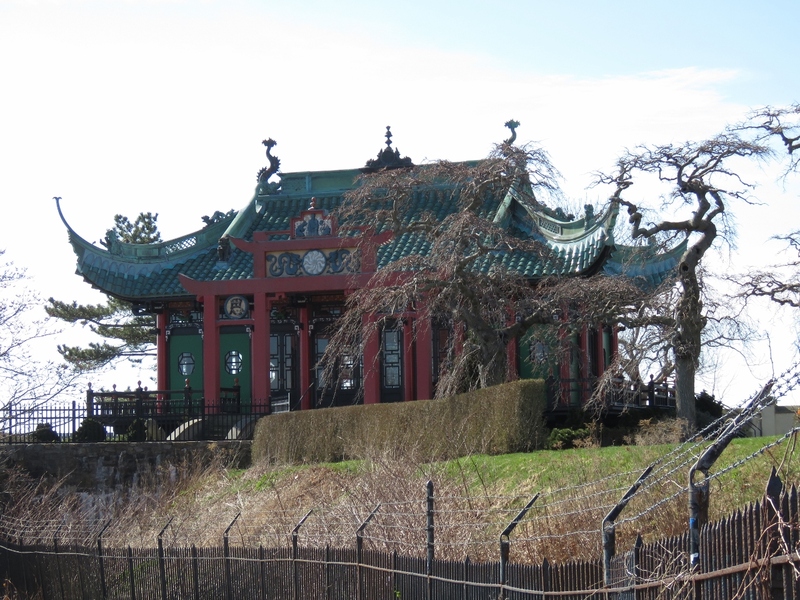 The Chinese Tea House on the estate of the Marble House, another famous Vanderbilt Newport mansion. 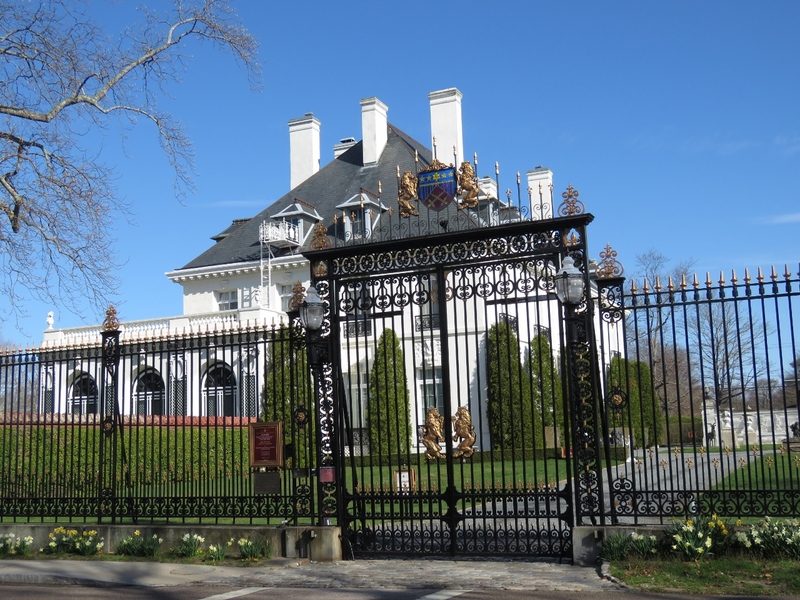 The fifty-room mansion was built for Alva and William Kissam Vanderbilt between 1888 and 1892 and helped spark the “summer cottage” boom in Newport. The total construction cost was was $11M (about $280M in today’s dollars), over 60% of which was spent on 500,000 cubic feet of marble. 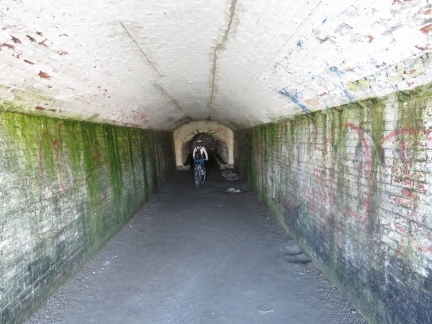 This tunnel under the Tea House was one of several we passed through on the Cliff Walk. 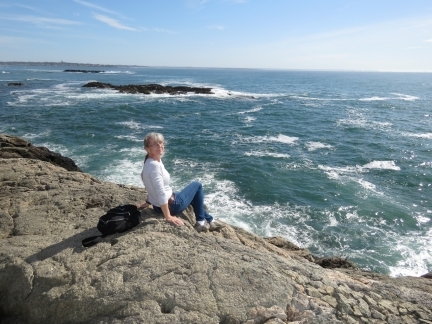 The view from Sheep Point across Sheep Point Cove to Ochre Point. The red roof of The Breakers is in the background at left. 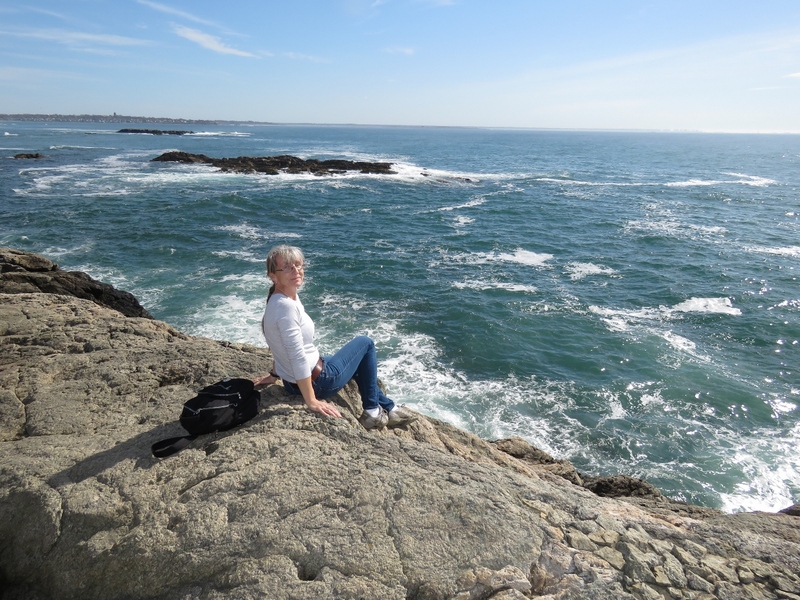 Enjoying a break along the Cliff Walk. It’s a wonderful trail and we really enjoyed it, even if we did have to carry the bikes along much of it. 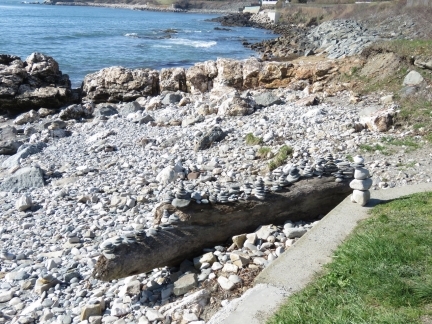 We left Cliff Walk near its terminus at Bailey’s Beach and biked along scenic Ocean Drive. This sphere as part of the Portuguese Discovery Monument at Brenton Point State Park, honoring the Portuguese Navigators of the Golden Age of Maritime Exploration from the early 1400’s to the late 1500’s. 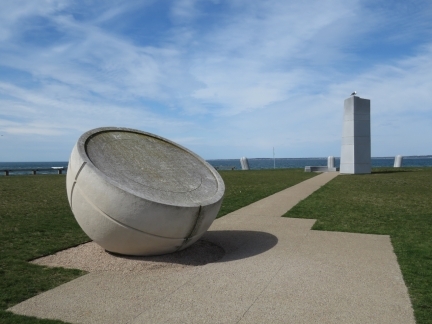 The sphere symbolizes an Armillary Sphere, a navigation tool made of an adjustable framework of metal rings representing latitude and longitude. 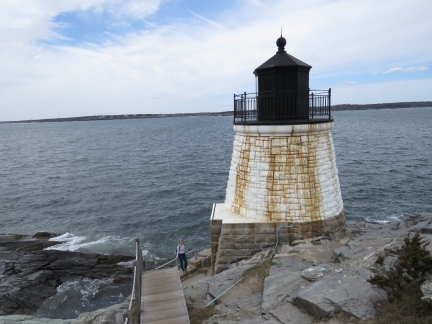 We passed the Castle Hill Light on our way into Newport. The light was built in 1880 and still is active. The Castle Hill Coast Guard station was built in 1941, in a more sheltered location than it’s predecessor on Brenton Point that was destroyed in a hurricane in 1938. 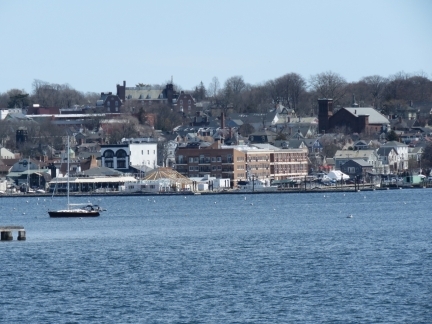 We can see Fort Adams from our berth at Newport Yachting Center and finally got over for a tour. This is looking back through the main entrance gate. 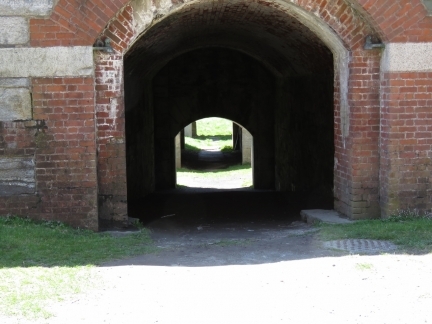 The fort was built between 1824 and 1857 and when the original cannons became obsolete, they were converted to the fenceposts visible on either side of the entrance. Fort Adams is the largest coastal fortification in the US. The parade area is 800ft across and covers 6.5 acres. 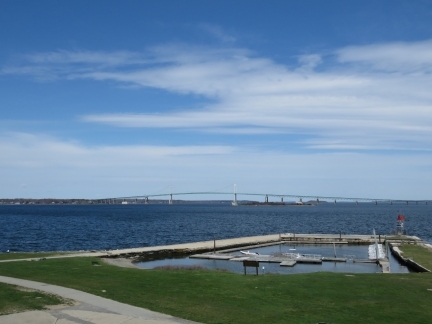 The view north from the Fort Adam’s northeast bastion to Rose Island and Newport Bridge. 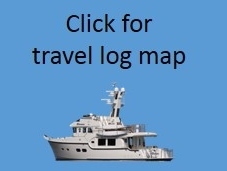 Dirona moored at Newport Yachting Center (in front of the brown brick building just right of center). We’re still the only boat in the marina. 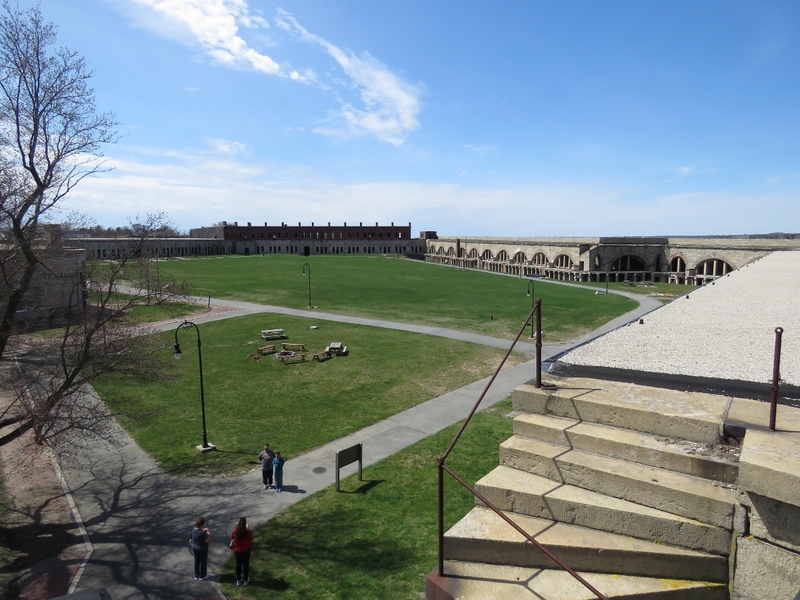 Fort Adams was designed by French military expert Simon Bernard, who was famous for building near-impenetrable fortifications. At the south end of the fort where a land attack might be feasible, the fort has two ditches that attackers must pass through in order to reach the interior. This is the view from the interior ditch down the southwest postern, one of two secondary entrances to the fort along the south wall. 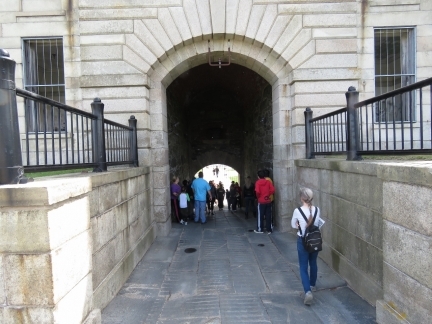 The postern passes through the fort’s exterior and interior ditches before reaching the parade area. 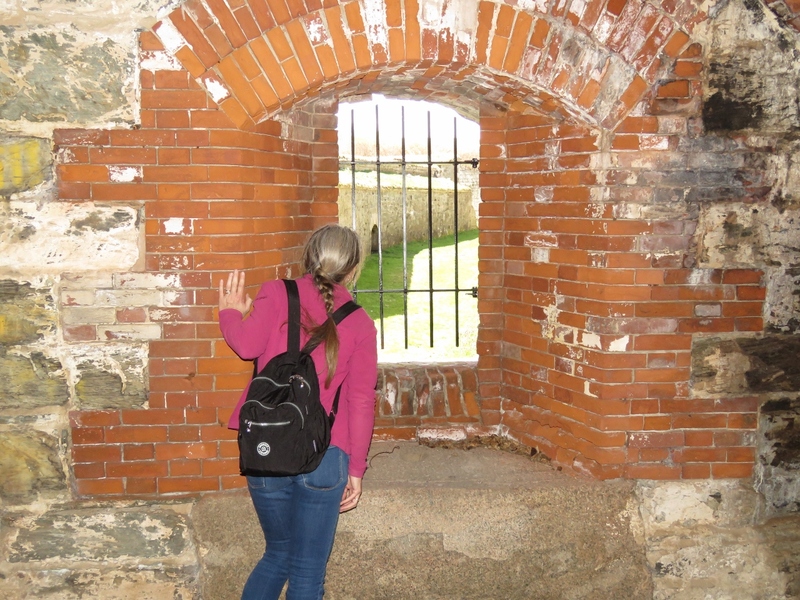 An enemy would need to reach a wooden door exterior of the fort, break down the door, then proceed through a passage guarded by musket fire through slits called “loopholes” along the sides, and break down another wooden door to reach the exterior ditch. They would then need to break down another wooden door to the next passage while taking cannnon and rifle fire in the exterior ditch, proceed through another passage under musket fire and break down a fourth wooden door before reaching the interior ditch. Then they would repeat the whole process once more to actually breach the fort. The odds of making it all the way through seem pretty slim. Looking out onto the interior ditch with the southeast postern visible on the left. The ditch was covered by cannon and rifle fire from many directions and designed as a killing zone. Should an enemy reach the ditch, they likely wouldn’t get much further. One of the few ways to breach a fortification such as Fort Adams is by tunneling under. 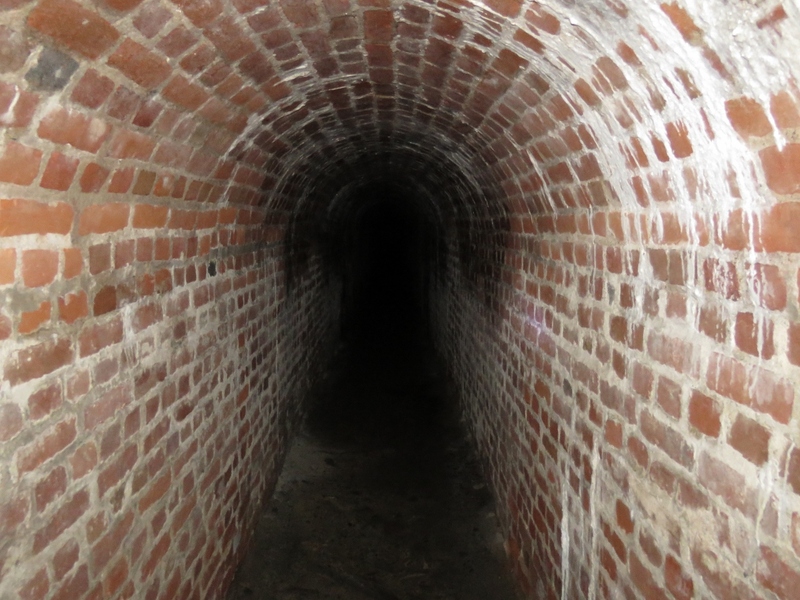 So in addition to many above-the ground deterrents, Bernard also designed numerous “listening tunnels” that extend out from under the fort to enable defending soldiers to patrol underground and detect the sound of enemy digging and attack them before they reached the fort.